One tiny region of Spain has had some unexpected -- and slightly concerning -- guests over the past several months: falling space junk. Members of the Explosives Deactivation Team transport space debris believed to be a spare fuel tank to a safe location. 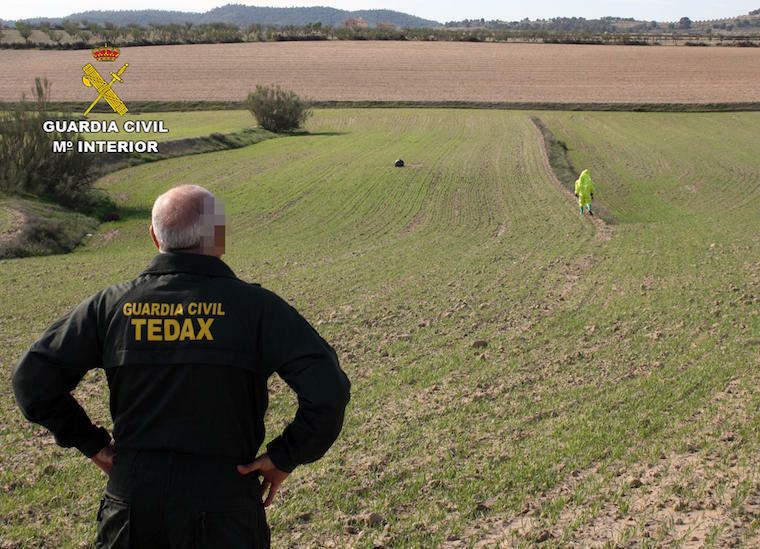 Image Source: Spanish Civil Police. The rural region of Murcia, Spain, just can’t seem to catch a break lately: It has the country’s highest poverty rate, had to ask for a bailout, and now it seems to have become a target for falling space junk. A few days later, local farmers and shepherds discovered two more objects, and the area was put under quarantine. These round objects measured around 25 inches in diameter — about the size of a yoga ball — and weighed around 44 pounds. 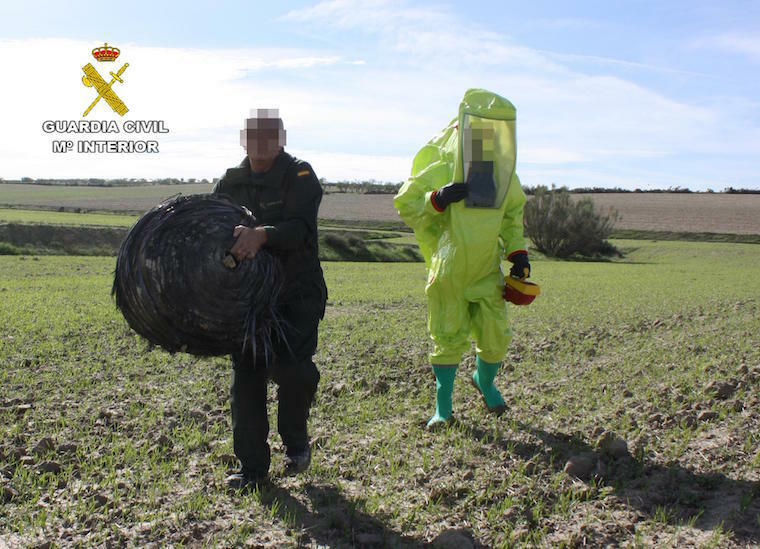 The Spanish official Explosives Deactivation Team inspects the object that fell from the sky to determine if it poses a risk for the population of the area. Source: Spanish Civil Police. Locals “saw an undetermined number of objects that looked like fire balls falling from the sky,” Soler told ATI. Fortunately, nobody has been hurt by these objects. The odds of one region being repeatedly hit by space junk are quite low, especially when you look at the numbers. At any given moment, around 500,000 pieces of space junk — here referring to human-made detritus — are orbiting our planet. While some pieces are so small they can’t be tracked, others are bigger than a softball, and can come hurling at you at ridiculous speeds. According to NASA, space debris travels at around 17,500 miles per hour, each piece becoming a flying weapon for spacecraft or the International Space Station. For that reason, NASA keeps a close eye on the junk’s trajectory (it even catalogues debris larger than the size of a marble) in case there is any risk of collision. And there is a risk: In 2014 alone, the International Space Station had to move three times to avoid fatal collisions with space junk. So what happens to the junk after it’s been found? 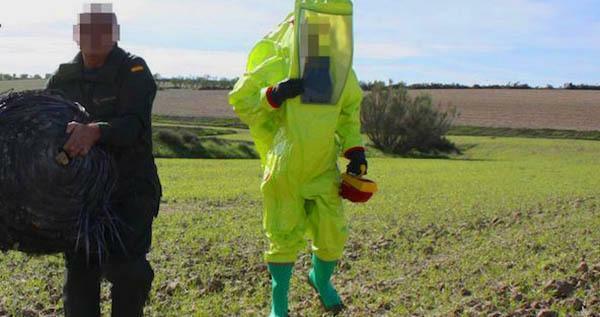 In Spain, procedure dictates that a team of explosive deactivation experts inspects the object to assure it doesn’t pose a risk. After that, it is kept in a safe location, waiting to be claimed. In Murcia, the local government actually wants to exhibit these objects, which are thought to be spare fuel tanks from a space ship or rocket. 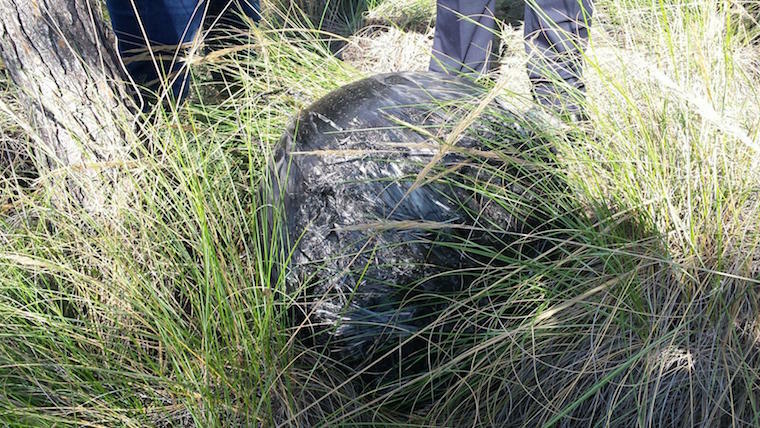 The three “balls” found so far are not the only items space has thrust at Spain: Other metal objects have been discovered on farms across southern Spain, and have normally been thought to be falling pieces of regular aircrafts. One of the pieces of space debris found in Murcia. Photo courtesy of Enrique Soler. According to the Head of the Space Situational Awareness Department at the European Space Agency, Earth is hit by these types of debris once a week, with a very small likelihood of harming human beings. The same type of objects found recently in Spain have also appeared in locations like Texas in the U.S., Brazil, and Australia. Next, check out these 29 space facts that prove life on Earth is boring.